One day after Italy responded to the EU's critical reception of Rome's budget proposal, all eyes were back on Brussels which some feared may implement the unprecedented step of demanding revisions to the budget as soon as today, something the European Commission has never done before. 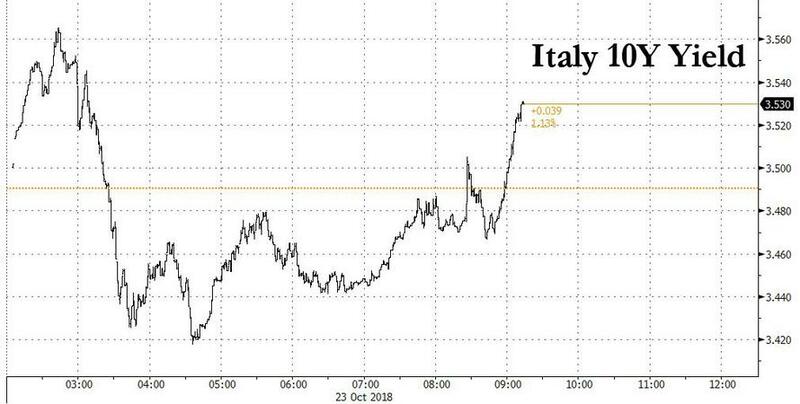 Well, moments ago Brussels did respond, and just as the worst case scenario predicted, Europe officially rejected the Italian budget proposal telling Rome to take back, revise and resubmit its budget. The rejection follows months of discord and tension over the spending targets, which Italy yesterday accepted breach EU rules but refused to adjust. As Bloomberg adds, while actual sanctions are still improbable and wouldn’t be levied for months, European officials have been wary of handing ammunition to Italy’s euroskeptic government that already waged one successful election campaign by blaming the EU for many of the country’s ills. 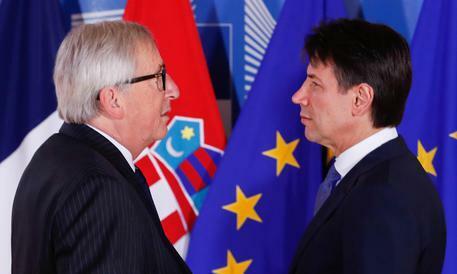 Europe's response came just moments after Italian Prime Minister Giuseppe Conte said in a Bloomberg News interview that his government has no “Plan B” to change its budget, despite the skeptical responses of the European Commission and investors. “There isn’t any B plan,” Conte said in the interview in English at his Rome office on Tuesday. “I said that the deficit at 2.4 percent of GDP is the cap. I can say this will be our cap,” he said, in reference to the planned budget deficit for next year. "We are ready to reduce maybe, to operate a spending review if necessary,” Conte said. “You have to consider that we are not gamblers that are betting on our kids’ future on the roulette.” Economic growth is “the best way in order to take us out of a debt trap." Conte dismissed the prospect of the spread with German bunds reaching 400 basis points, a level that Credit Suisse AG said could put unsustainable pressure on Italy’s banking system. He also reaffirmed Italy’s commitment to the euro. “I have the evidence that part of the spread is due to the prospect of Italexit,” Conte said. That... or the ruble. According to press reports, Salvini is already testing the ground for Russia to buy Italian bonds if and when the ECB's QE ends (or when Rome withdraws from the Euro). As a result of both sides' adherence to their bargaining position, Italy’s populist government remains on collision course with Brussels as its spending targets far exceed EU limits, and with neither side willing to budge. The commission, the EU’s executive, is due to respond to Italy’s spending plans later on Tuesday, when it may opt to formally demand that Rome takes back, revises and resubmits its budget.